This edition of what has swiftly become my favorite feature about this blog (seriously, I am digging it. Send me your food pictures, people! This is way more fun for me than you even know!) comes from my colleague in intrepid herbivorous dining, Christy aka The Blissful Chef! So get this! Joe and I were sitting at a dining table at May Kaidee’s Restaurant and Cooking School in Bangkok the morning after we arrived in Thailand, hitting the ground running with the filming schedule for this pilot episode we’ve been telling you all so much about. A woman who was eating and reading at another table approached us and said “Are you Joe and Sadie? 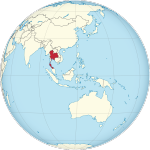 ?” Christy was in Thailand working on a cookbook and had seen our Kickstarter video, from which she recognized us. I had heard about her because of another blogger/mutual friend had said this Christy person was going to be at large in Thailand around the same time that we would be there, and, well, we didn’t have to coordinate anything to meet up because we happened to be in the right place at the right time! Christy is a chef, fitness guru and all-around health advocate who writes wonderful cookbooks as well as recipes, workout tips and general lifestyle encouragement on her blog, The Blissful Chef. If you’ve been paying attention over here, you may have already noticed that she often invites awesome guest contributors to her own blog. Ah, near and dear to my heart is Thailand, the subject of the forthcoming pilot episode. I have written quite a bit about my own experiences here, the food, and the themes of “The Intrepid Herbivores” throughout this blog (and we have a full-length TV episode all about it). We discovered that eating a vegan diet here was exquisitely easy. Just a few basic vocabulary terms had us well on our way to enjoying the varied and flavorful cuisine of this beautiful and history-rich country. The indomitably pink dragonfruit, captured on camera by Christy. WHAT IS IT? Dragonfruit, also known as pitaya, and by some as the “strawberry pear.” Found in tropical climes, this is the fruit of a species of cactus. I had written briefly about dragonfruit a while back but Christy’s photo is so luscious that I deemed it a topic more than worth revisiting. Its vibrant, almost cartoonish outsides protect a delicate, juicy white (or light pink) flesh studded with large black seeds. The flavor is reminiscent of a melon but with a bit more floral tones. WHERE CAN I FIND IT? My research tells me it’s actually native to Central and South America, but it is now grown, sold and consumed widely throughout Southeast Asia. It requires a hot climate for the plant to thrive. Once you’re in a place where dragonfruit is readily available, it will be hard to miss! 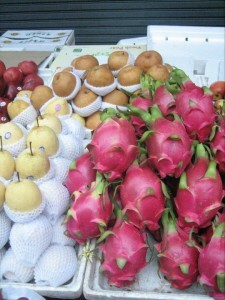 While in season it is prominently displayed at markets and street stalls everywhere, as you can see by Christy’s photo. Even in a landscape full of colorful sensory overload, the dragonfruit stands out as an attention-grabber with is bright pink skin, green accents, and striking shape. You will need a knife to peel and slice these beauties. WHAT ARE SOME PHRASES TO HELP ME ORDER FOOD IN THAILAND? Kin j ay: I eat vegan. Mai sai nam pla: Don’t use fish sauce. Ka/kap: Courtesy words (female/male), useful to tack on to any request if you’d like to be polite. THAT LOOKS AWESOME BUT IT WILL BE AWHILE TIL I CAN VISIT THAILAND. HOW CAN I EXPERIENCE DRAGONFRUIT AT HOME? It is possible to get imported dragonfruit in the US (most of which will be coming from Central or South America) at specialty markets, however they will be expensive and a bit worse for the wear. If your Asian market does not have fresh produce available, try looking for it in its canned or frozen varieties. However, in the US there is at least one option to order US-grown dragonfruit. And my research also suggests that it is possible to grow the cactus as a houseplant in most areas, though it is not likely to fruit in those conditions. I do love tropical fruit but living in the Pacific Northwest (and before that, the Midwest) regions of the United States, it is something that deserves a bit of forethought and mindful consumption. I am known to purchase and enjoy the occasional imported specialty item, but I try to reserve most of my splurgings on exotic fruit for when I am actually in a region where they are grown locally. Not only does imported fruit lose much of its vigor on its voyage, presenting you with a pale shadow of the spectacular produce it once was, there is a costly and energy-hungry expedition required to bring it from its farm to me. Eating things like dragonfruit, mango, pineapple, durian, even bananas, etc. every day is sadly not a sustainable indulgence for us here in my neck of the woods. But I don’t think that means that we should shun such things entirely. Food is a fun way to experience faraway lands, and on occasion it is a worthwhile exploration to check out the tropical or imported section of your grocery store. This entry was posted on July 19, 2013 by sadie in Guests, thailand, travel stories, Uncategorized.